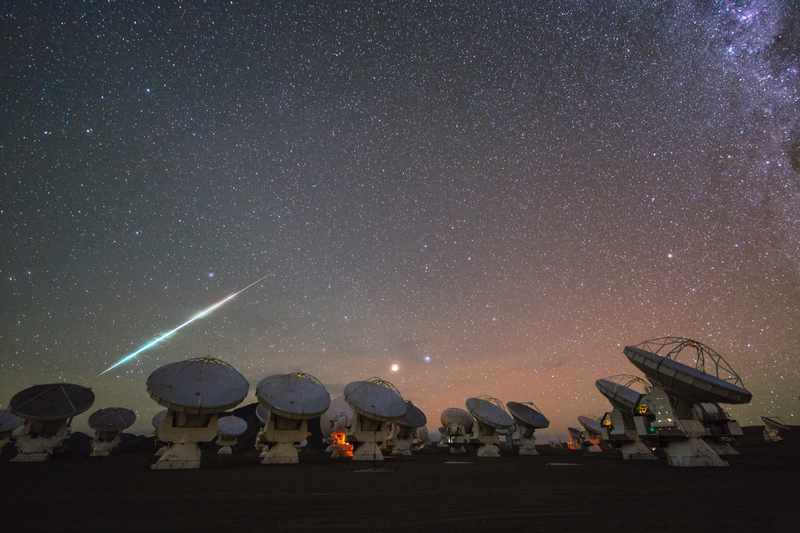 Meteor over ALMA: Fantastic picture by Christoph Malin. Sometimes it pays to be lucky. The European Southern Observatory posted this incredible shot by the accomplished astrophotographer (and friend of the blog) Christoph Malin taken on March 25, 2014. Feast your eyes on this! The journey of a billion years ends in the flash of an instant. Click to enablatenate. Judging from the brightness, I’d guess the meteor was probably from a bit of cosmic detritus the size of your fist, maybe a bit smaller. It looks like it was illuminating high, thin cirrus clouds as it fell (that jibes with the silhouetted clouds you can just see to the right of it). The different colors are interesting; that may be due to different materials in the meteoroid (the solid bit) incandescing as it heated up. The telescopes in the foreground belong to the ALMA observatory, an array of dishes that are sensitive to light at millimeter and submillimeter wavelengths (between infrared and radio wavelengths). Malin was just trying to get the lovely starry background there, and got lucky with the meteor. Speaking of which, the bright red “star” in the image is Mars, and the lovely blue one next to it is Spica (both of which played second fiddle to the Moon in the eclipse recently). At the upper right you can see the fuzzy pink glow of the Eta Carina nebula, one of the most chaotic and nasty parts of our galaxy, where stars are being born at prodigious rates. This photo was done as part of the ESO’s Ultra-HD expedition, and I’m glad Malin was along for that. He’s highly skilled and had a great location. But luck (really probability x time) clearly plays its role, too.